EV 100 is a thin wall heat shrinkable tubing in cross-linked polyolefin, economic, suitable for electrical insulation and general applications where a low shrinking temperature is required. Available in reel, dispenser box, 1 mtr. length. Diameters available: from Ø 1,6 mm to Ø 50,8 mm. Working temperature: -30°C ÷ 105°C. ET 100 is a thin wall heat shrinkable tubing in cross-linked polyolefin, self-extinguishing, flexible and strong, with chemical resistance and safety in the electrical insulation, suitable for general applications. Available in reel, dispenser box, 1 mtr. length. Diameters available: from Ø 1,2 mm to Ø 101,6 mm. Colours available: black, white, red, blue, transparent, green/yellow. Working temperature: -55°C ÷ 135°C. Flammability rating: self-extinguishing UL 224 (except transparent). 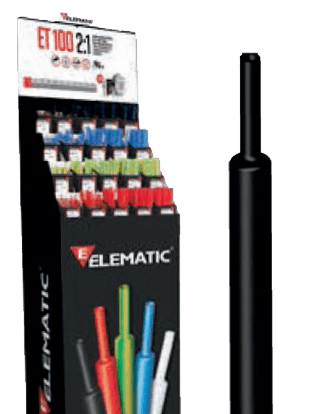 EL 100 is a flexible, self-extinguishing thin wall heat shrinkable tubing in cross-linked polyolefin, suitable for professional applications in electrical and electronics sectors, in particular for cable insulating, marking, and identification. EL 100 ensures an excellent flame resistance. Available in reel, dispenser box, 1 mtr. length. Diameters available: from Ø 1,6 mm to Ø 101,6 mm. Flammability rating: self-extinguishing UL 224 - VW1. ET 301 is a thin wall heat shrinkable tubing in cross-linked polyolefin, self-extinguishing, flexible and strong, with chemical resistance and good capacity of electrical insulation, suitable for general applications. Thanks to its high shrinking ratio, more applications can be covered with the same diameter. Its high expansion ratio is designed for use when wide ranging substrate diameters need to be covered. Available in reel, dispenser box, 1 mtr. length. Diameters available: from Ø 1,5 mm to Ø 39 mm. Flammability rating: self-extinguishing UL 224. Technical data tubing: see ET 100. Ø Int. sleeves (mm): from 1,2/0,6 to 19,1/9,5. Colours sleeves: black, transparent, blue, red, white, green/yellow. Total: 406 pcs / 21.700 mm. Flammability rating: self-extinguishing UL 224, 125°C (except transparent). Technical data tubing: see ET 301. Ø Int. sleeves (mm): from 1,5/0,5 to 24/8. Colours sleeves: black, blue, red, white, green/yellow, brown. Total: 170 pcs / 10.640 mm. Flammability rating: self-extinguishing UL 224, 125°C. EL 301A is a flexible, heat shrinkable tubing in cross-linked polyolefin, with thermoplastic adhesive inside suitable for professional applications, such as insulation, identification and protection of wires and cables, in electric and electronic components. Its high shrinking ratio and its inner liner allow to seal and encapsulate the inner components, covering sections of different dimensions. Available in reel, dispenser box, 1 mtr. length. Diameters available: from Ø 3 mm to Ø 24 mm. Flammability rating: self-extinguishing (external wall). Insulation and protection cables and joints. EL 401A is a flexible, heat shrinkable tubing in cross-linked polyolefin, with thermoplastic adhesive inside suitable for professional applications, such as insulation, identification and protection of wires and cables, in electric and electronic components. The high shrinking ratio and the thermoplastic adhesive inner liner allow to seal and encapsulate components, covering sections of different dimensions. Available in reel, dispenser box, 1 mtr. length. Diameters available: from Ø 4 mm to Ø 52 mm. 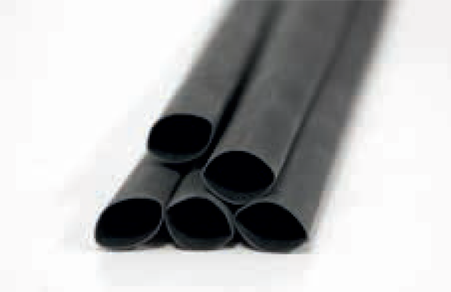 EM 100A is a medium wall heat shrinkable tubing in cross-linked polyolefin, with internal thermoplastic adhesive, suitable for a wide range of applications, such as insulating and protecting cable joints and terminations. The inner liner provides good moisture sealing and weathering protection. Good strain and abrasion resistance. Available in reel, dispenser box, 1 mtr. length. Diameters available: from Ø 12 mm to Ø 180 mm. Working temperature: -40°C ÷ 120°C. Insulation and protection cables and joints. Insulation and protection cables and joints also in underground laying. Excellent insulating and waterproofing properties.